The president of Bangladesh, Zillur Rahman, has died after a long illness, a spokesman for the prime minister's office in Dhaka has announced. The president, 84, had been undergoing treatment at a hospital in Singapore. President Rahman was elected by parliament to the largely ceremonial role in February 2009. Mr Rahman was a stalwart of the Awami League - now in power in Bangladesh - and a close friend of the country's first president, Sheikh Mujibur Rahman. Sheikh Mujib was the father of current Prime Minister Sheikh Hasina. Mr Rahman was sentenced to 20 years in jail during Bangladesh's 1971 war of liberation from Pakistan and was again imprisoned for four years after Sheikh Mujib's assassination in 1975. 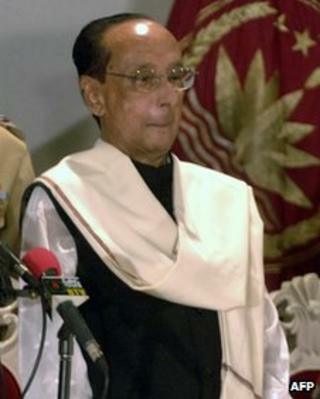 He also briefly went to jail after elections in 1986 while he was an Awami League MP. He was being treated in Singapore for kidney and respiratory problems.